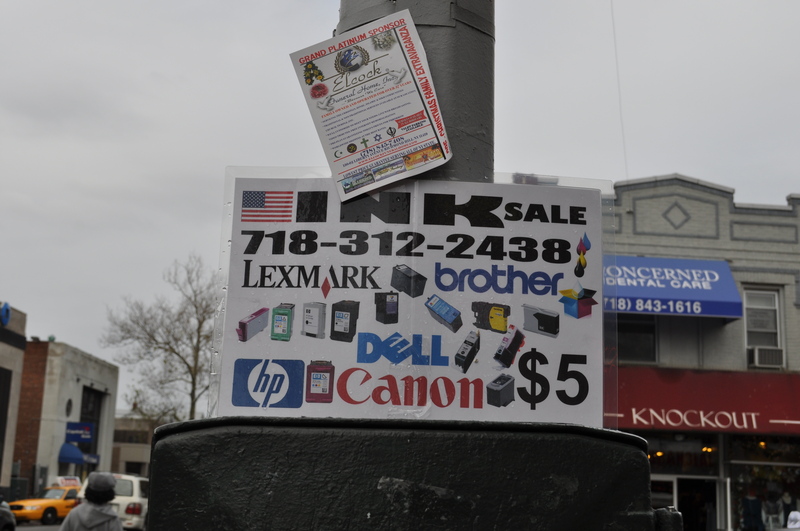 Illegal signs are being targeted for removal around parts of Queens, with city officials asking for the public’s help in reporting such unwanted ads. At least 30 illegal signs and advertisements were removed last week from numerous utility poles and other locations around Woodhaven, Richmond Hill and Ozone Park, city and civic officials confirmed. With a push from local legislators, the city Department of Sanitation (DSNY) began taking down the signs last week based on a number of complaints from local residents. The majority of the signs were taken from thoroughfares such as Jamaica Avenue, Woodhaven Boulevard, 101st Avenue and Lefferts Boulevard. Sanitation department enforcement agents will use phone numbers and business names listed on the ads to track down violators and issue summonses for each sign. Several signs were taken down in the area extending from 101st Avenue to Lefferts Blvd, according to several officials. Signs were removed from other areas including intersections at Jamaica Avenue and 96th Street, Atlantic Avenue and 91st Street, Woodhaven and Jamaica Avenue, 101st Avenue between 93rd Street and Woodhaven Boulevard, among others. When contacted, the man who answered the phone number advertised on one sign touting a towing service refused to give the business’s name, an office location, or even his own name. According to Bart Haggerty, chief of staff for city Councilman Eric Ulrich’s office, area civics have previously complained to city officials about the problems. Ulrich lauded the removal of the signs, adding that businesses posting the unauthorized ads were disregarding city laws “in search of a quick buck”. According to Assemblyman Michael Miller’s office, Woodhaven residents, in particular, have repeatedly called about the problem. Miller explained that illegal signs are a quality of life issue, and sternly rebuked those responsible for posting the signs. According to Ed Wendell, president of the Woodhaven Residents’ Block Association (WRBA), the problem has been something that became bothersome around Woodhaven last year when, almost overnight, a large number of streets in the area were covered by signs from a mortgage company. Wendell personally contacted the company; however, no action resulted. After calling 3-1-1 to report the signs, members of the WRBA were told that instead of reporting all the illegal signs at once, they had to make one call to 3-1-1 per sign—a process Wendell implied was tedious. They also spoke with Miller and Ulrich, who offered to take the list and send it to the sanitation department. Aside from their unattractive appearance, Wendell noted that illegal signs pose dangers for residents when they try to get them down from hard-to-reach areas. But if left unchecked, Wendell said that more signs could pop up around the neighborhood. To remedy the situation, DSNY has started Project Sign Off, a new initiative that reaches out to local civic groups to get them involved in the removal of signs. Robert Holden, president of the Juniper Park Civic Association, said Wednesday that while DSNY’s new program makes an effort to tackle the problem, he wanted the department to issue stiffer penalties against the companies who are posting the signs. Also, Holden also questioned how effectively DSNY could remove the advertisements with fewer inspectors around and the difficulties of reaching 3-1-1 to report illegal signs. “Sanitation really doesn’t come around on the weekends for a lot of these streets. There just aren’t enough inspectors,” he said. In partnering with DSNY, local officials are encouraging residents to contact sanitation officials and report those sings instead of taking them down by themselves. Iggy Terranova, DSNY community affairs officer, said this was not a new measure, but a reminder of current procedure through which people can report illegal sign infractions. After reports of signs are taken, DSNY enforcement makes inspections and takes down illegal signs and issue summonses. The department can issue up to $75 fines per each illegal sign that its agents collect; however, Terranova said, his department has fined such companies thousands of dollars in the past. When asked about enforcement, Terranova said he believes his department can get the job done. While thanking Miller and Ulrich for their help in addressing the issue, the WRBA is also urging city officials to make changes to the rules around reporting illegal signs. Under the current rules that outline private citizens’ testimony—including pictures of illegal signs—is not useable in prosecuting those who post such advertisements on telephone poles, lampposts, and other public property. When private citizens remove illegal signs, sanitation officials can’t prosecute those responsible for the signs, the rules also state. “It doesn’t make sense. If people are willing to document it as proof to enforce the rules, why would you turn that down?” Wendell said, noting that sanitation may not always be around or have time to enforce every violation. Holden agreed, stating that people should be allowed to take pictures of such signs and submit them as evidence to go after the people who post them.